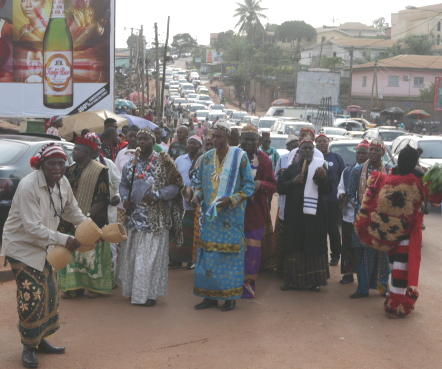 A delegation of Ékpè ‘leopard’ society initiates, as well as family members, traveled from Mamfe, Manyu Division of southwest Cameroon, to Yaoundé, the Cameroon capital to honor and reclaim the body of their leader and father, who had recently transited to the ancestors. Mr. Tanyi Bantriri Egbe Stephen Tataw held the Ékpè title of Seseku, the highest among Manyu people. 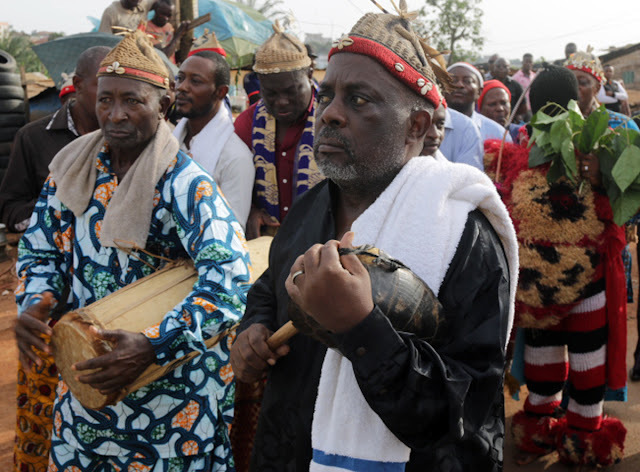 The title Sese-ku means ‘Lord Tortoise’ or ‘the Wise Lord’ in the neighboring Òrọ̀kọ́ culture to the south of Mamfe, according to linguist Blessed Ngoe. In Bàlóndó culture, which is under the umbrella term Òrọ̀kọ́, the tortoise is often referred to as “Tata Na-ku”, ‘Father Mr.-Tortoise’, rendered phonetically as “Tàátà nàákúù” (Kuperus 1985: 130, 142). The tortoise shell is fundamental to Manyu Ékpè practice as a powerful communicative instrument and a sacred sound vibration, known as nèwèn-Békúndí in Kenyang language. Therefore the tortoise shell was necessarily present for these rites. 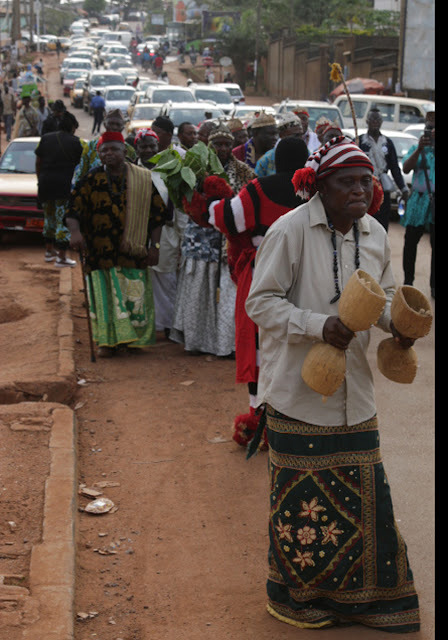 Since 1960-61, with the independence of The Camerouns from French and British colonial rule, there has existed a Manyu population in Yaoundé, the capital. The Manyu people are comprised of Éjághám-speakers, Kenyang-speakers, and Anyang-speakers (collectively known as Bayangi people), and all of them participate in Ékpè ‘leopard’ society culture. In Yaoundé, Manyu people gather at the Manyu Cultural Center on Rue Martin Tabi Essomba in Yaoundé 4. It was here that Seseku Stephen Tataw was honored on March 29 by the Manyu community after preliminary rites in the funerary home. 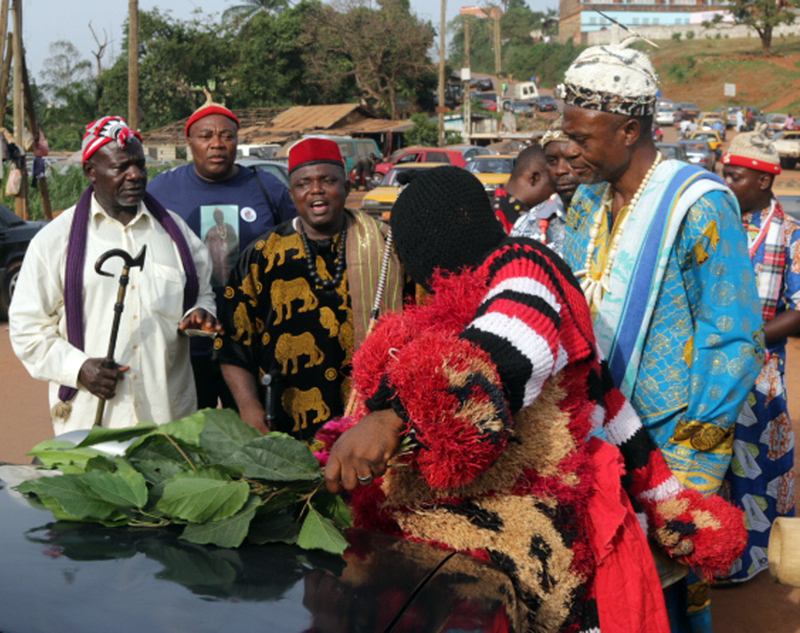 After the hearse arrived with the coffin, the Ékpè members purified the vehicle, then led it in procession to the cultural center. 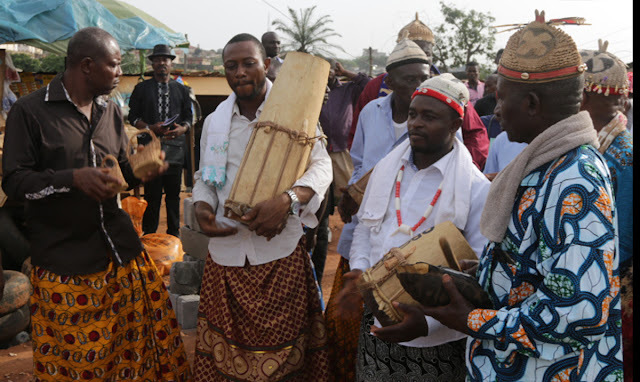 The procession was led by Mùrúà ‘the chanter’ with his wooden rattles, then the mask, called Emanyankpe, followed by the title-holders, the musicians and finally the coffin. 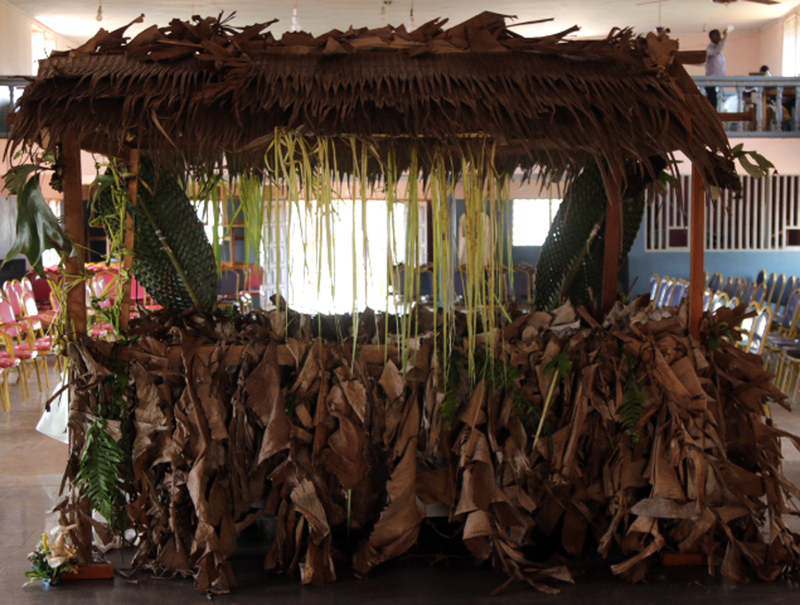 Inside the hall, a shrine was constructed to receive the coffin. 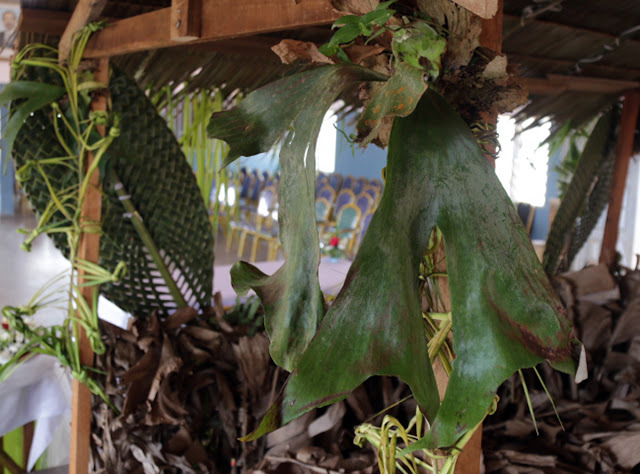 Adorned with plantain leaves, palm fronds tied in symbolic ways, and mfam leaves, this shrine represents the sacred forest of Ékpè. 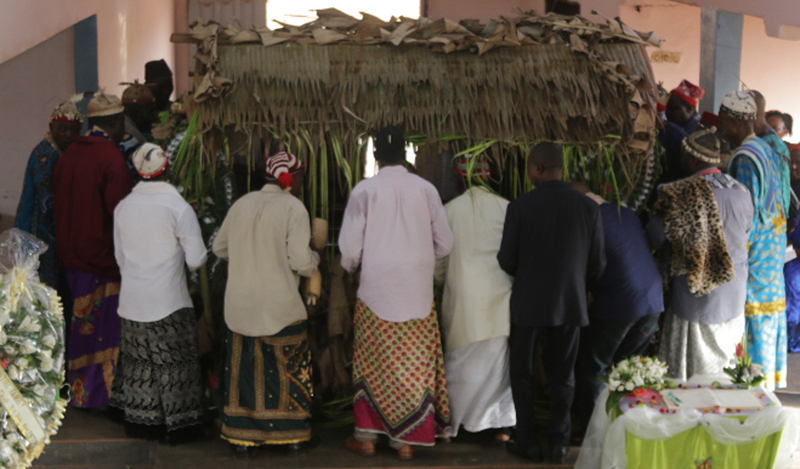 Around this shrine, the Sesekus, divine chanters and musicians performed the final rites for the deceased Seseku, to ensure his spiritual journey to the land of the ancestors and gods, and to ensure the continuity of the Ékpè institution. 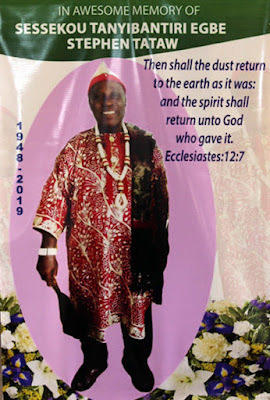 The rites concluded, the deceased was carried in a community caravan nearly 700 kms back home to Mamfe for further purifications before internment to mother earth. This collective activity exemplifies how a dynamic culture like the Ékpè institution is carried into diaspora by its members wherever they may go and maintained collectively as a mutual-aid and spiritual society. Even with the multiple pressures of the so-called modern world: labor migration, wage slavery, environmental destruction, the impact of monotheism (Islam and Christianity), western education, and so on, indigenous community networks like Ékpè have proven resilient and utile for the well-being of its members, their families and communities. Ayuk, Raphael. 2019. CERDOTOLA scholar and Manyu community member. Ngoe, Blessed. 2019. Scholar of Òrọ̀kọ́ language and culture. Personal communication with the author by email. March. Kuperus, Juliana. 1985. The Londo word: its phonological and morphological structure. Tervuren, Belgique: Musée royal de l’Afrique centrale.